Is a pondless water feature the right option? Water bubbles up and cascades over this millstone fountain and appears to disappear directly back into the ground. Huettl Landscape Architecture in Walnut Creek, CA. 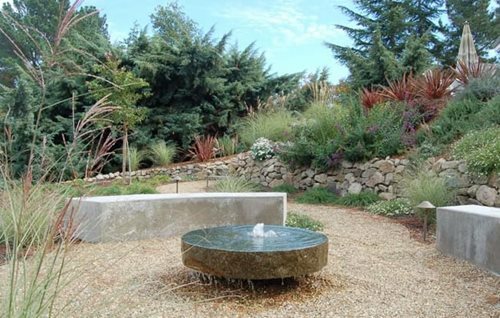 A pondless or disappearing fountain is one in which the water reservoir is hidden underground. 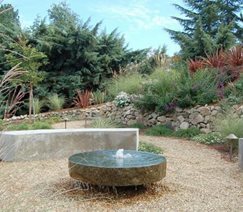 Many landscape designers use pondless water features near a patio or along a path to provide a unique visual and add the soft sounds of water. Popular disappearing fountain styles include ceramic urns, millstones, carved rocks, granite columns, or naturalistic waterfalls. The basin on which the fountain rests can be covered with river rock, gravel or another decorative stone that allows water to pass through. There are a number of reasons why a disappearing fountain may be the right option for your yard. First, they are child-safe. Because there is no open water basin or pond there is no risk of drowning. Second, they use less water than traditional fountains. Since the water reservoir is underground the sun does not trigger evaporation and cause water loss. Third, a pondless fountain requires very little maintenance. Debris, such as leaves or dirt, cannot enter the reservoir and the sun does not promote algae growth. Finally, they are very suitable for small spaces. Disappearing fountains can be installed just about anywhere, take up very little space and don't overwhelm a yard with their presence. Pondless fountains can be custom built or installed with a kit from a pond supply company. A kit will cost more up-front, but will be easier and quicker for your contractor to install. Some kits come complete with the decorative feature, others only have the reservoir, pump and grate. If the latter is the case, you will need to select your own ceramic urn, or stone feature to act as the bubbler.